With content marketing as big as it currently is, many marketers are looking at how to effectively repurpose their content within email as well as use the channel to drive more clicks to their work. In fact, according to Yesmail's 2016 Channel Report, 84 percent of retailers have adopted social sharing tools, which allow them to embed links or visuals in an email that encourage subscribers to share branded content with their own social networks. However, over a third of those retailers are not integrating this technology with major social media channels like Facebook and Twitter - missing out on more clicks (and possibly conversions). Likewise, over two-thirds of brands are not integrating email with their mobile app even though 22 percent of them have one - failing to capitalize on all engagement channels. While encouraging users to share content with their peers across touchpoints is an effective way to increase a piece of content's reach, there are other strategies that can be used to ensure brands are creating content that will return results, such as lead generation. While many companies are privy to this - Content Marketing Institute's "2016 Benchmarks, Budgets and Trends - North America" survey indicated that e-newsletters top the list of content offers B2B marketers ask audiences to subscribe to (87 percent) - 22 percent of brands do not implement welcome campaigns to engage new subscribers at all and 43 percent do not use reactivation campaigns to re-engage lapsed or inactive subscribers, according to Yesmail's data. 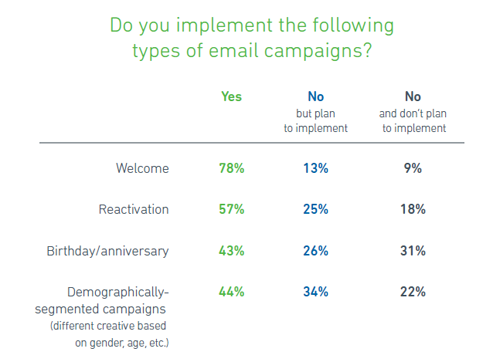 This is a problem because, as Yesmail states, "From initial interaction to sustained customer relationships, brands are not using the right types of email campaigns at each step of the sales cycle to convert subscribers into buyers and, ultimately, brand advocates." When launching or optimizing a content marketing initiative this year, marketers should pay attention to email's role in turning readers into buyers and engaging them over the long term.